In 1974, Michel Richard left France to help Gaston Lenôtre, an iconic pastry chef, open a high-end pâtisserie in New York City. It closed in a year, but Richard stayed in the US and became a legend himself. After launching the L.A. hot spot Citrus in 1986, Richard followed with a string of fantastic restaurants around the country and in Tokyo. Today, the chef’s home base is Washington DC, where he cooks at Central Michel Richard and his flagship, Citronelle (now undergoing renovations and scheduled to reopen in late 2013; he also has a second Citronelle location in Carmel, California). 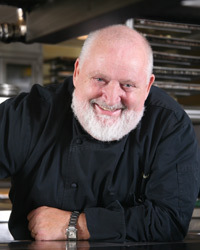 Along the way, he also authored three exceptional cookbooks: Michel Richard’s Home Cooking with a French Accent (1993), Happy in the Kitchen (2006) and Sweet Magic (2010). As Richard prepared to return to New York for the opening of his latest project—a restaurant and pastry shop inside the grand Palace hotel—he sat down with Food & Wine to discuss his youthful love of Kentucky Fried Chicken, how he cooks great food in a microwave and where to find the world’s best crispy pork skin. The lobster “begula” pasta at Citronelle. We prepare couscous almost like a risotto with black squid ink to make it look like caviar. We layer that over a poached egg, some lobster cooked in butter and a lobster hollandaise. It is served in the caviar tin so it looks exactly like a can of fish eggs. It’s such a surprise when you dig your spoon into it. The egg-ceptional dish at Citronelle is so wonderful. We create an eggshell using white chocolate, and we fill that with lemon meringue “yolk.” It looks exactly like a regular egg, but when you eat it, it’s light and beautiful. I have never seen anything like it anywhere else. I’ve served our chocolate bar dessert in every restaurant of mine. I remember when I first moved to this country, a friend of mine took me on a trip to New York. We didn’t have much money and we went to Kentucky Fried Chicken. I fell in love with that crispy texture, and since I moved here 38 years ago, I try to bring crunch to every dish. For this dessert I mix gianduja (chocolate with hazelnuts) with fresh potato chips to give it texture, and I serve that with chocolate mousse. The Encyclopedia of Practical Gastronomy, by Ali-Bab. It was published at the end of the 19th century. I have a thousand cookbooks but I prefer that one. It’s beautiful and there are so many good ideas in it, like one recipe for an apple mousse that is just apple puree and gelatin whipped over ice. Everyone should know how to use a microwave. It’s a wonderful tool that can help you be a great chef. I make pastry cream and pudding in my microwave. If I want to do a béchamel, I’ll mix the milk with flour and butter stick it in the microwave—it will never scorch or burn. I use the microwave for almost everything. Madras curry. Just a pinch, even in a salad or a dessert is very nice. Madras just gives an extra dimension of flavor that tastes almost like roasted hazelnuts. If you can taste it, you’ve added too much. I think people will use more and more quinoa. It tastes good, it’s easy to serve and it cooks up fast. It’s also healthy. When I come home and don’t know what to cook I just grab the quinoa and eat it with cream sauce or with a vinaigrette and it’s delicious. If you were going to take Anthony Bourdain out to eat, where would you bring him? I would take him to a Chinese restaurant here in Washington called Great Wall Szechuan House. They serve pig with crispy skin and it’s delicious. For $16 you’re eating the best pork skin in in the world. “C” in English for chicken, and “P” in French for poulet!